The Cambridge Community Chorus (CCC) was founded in 1990, and has in the past 18 years grown in size and skill under the leadership of William Ethaniel Thomas. Thomas is retiring from his post and led his farewell concert in Sanders Theatre on May 25 before an enthusiastic audience. For his final program Thomas chose two large works: one by Franz Joseph Haydn (1732-1809), and one by Samuel Coleridge-Taylor (1875-1912). Thomas decided to start with the last of Haydn’s dozen Masses, partly because it was one of the earliest works he conducted as a mainstay of the Andover Academy music department for 35 years. This Mass in B-flat major, written in 1802 at the height of Haydn’s powers, was the composer’s last big work, and is known as the “Harmoniemesse.” It is a mistake to call it the “Harmony Mass,” for all of Haydn’s Masses of course have harmony. The designation arises from the fact that “Harmonie” here is the old word for “wind-band,” and refers to the prominent use of wind instruments. The Mass is scored for flute, pairs of oboes, clarinets (rarely used by Haydn), horns, bassoons, trumpets, timpani and strings, plus four vocal soloists in addition to the chorus. When Haydn performed the work at the Esterhazy court on 8 September 1802 he had only eighteen singers. This time Thomas had the luxury of 106 choristers, plus a solid quartet of vocalists: Barbara Kilduff, soprano; Krista River, mezzo-soprano; Charles Blandy, tenor; and Philip Lima, baritone. In this glorious 50-minute piece it was thrilling to hear such a full body of singers, well drilled and nicely blended. Like James Levine, Thomas now conducts seated. His love of the music was palpable, and he cued his performers clearly. In the Credo, the clarinets were prominent, and Haydn dared to have the trumpets play softly. The Agnus Dei had woodwinds alone at the start; the four soloists sang by themselves for a long time, increasing the effectiveness when the chorus finally re-entered with “Dona nobis pacem” and some striking syncopation near the end. Following intermission, Thomas turned to “Hiawatha’s Wedding Feast” by the remarkably gifted Afro-British composer Samuel Coleridge-Taylor. Conductor Thomas, who is black, has for years championed the music of Coleridge-Taylor. Wearing his other hat as a cellist, Thomas founded the Coleridge Ensemble and has performed and recorded the composer’s chamber music. 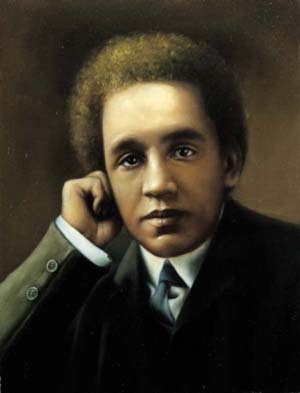 Coleridge-Taylor learned the violin and piano early, and exhibited unusual compositional talent already as a teenager, soon drawing praise from Sir Edward Elgar and Sir Arthur Sullivan. At the age of 23 he became a celebrity with the 1898 premiere of “Hiawatha’s Wedding Feast” for chorus, tenor soloist and a sizeable orchestra including three trombones, tuba, tambourine, cymbals, bass drum, and harp. For many years the piece was, except for Handel’s “Messiah,” the most frequently performed choral work. Longfellow’s book-length “Song of Hiawatha” (1855) was more widely read in Britain and America than it is today. Coleridge-Taylor was attracted by all the poem’s unusual Amerindian proper names, besides sympathizing as a buffeted black man with a mistreated American race of people. The success of this cantata led him to follow up with two more instalments: “The Death of Minnehaha” (1899) and “Hiawatha’s Departure” (1900). Coleridge-Taylor even named his son Hiawatha (1900-80). A decade ago Thomas and the CCC performed the “Wedding Feast” in the same venue to mark the work’s centennial. It was fitting for him to revive it as his valedictory. He, the chorus and the 45 instrumentalists gave us a powerful and committed reading of the piece. Two-thirds of the way through there came the tenor soloist’s aria, ‘Onaway, awake, beloved,’ written in the unusual key of G-flat major. It used to crop up in song recitals though it is not often heard these days. Charles Blandy sang it delectably, and nailed the climactic high B-flat at the end. The cantata received its U.S. premiere right here in Boston, sung by the Cecilia Society under its founding conductor Benjamin Johnson Lang (1837-1909) on 14 March 1900. And the composer’s autograph score is owned by the Boston Public Library. Coleridge-Taylor went on to compose a surprisingly huge body of music for a person who died at the age of 37. But he never repeated the success of the “Wedding Feast.” Today his most popular work is probably the masterly late four-movement “Petite Suite de Concert” (1911) for orchestra. With Thomas’ retirement, the CCC has hired as his successor Jamie Kirsch, currently at Vanderbilt University in Tennessee. Kirsch has a hard act to follow. Thanks for coming to our concert and for your appreciative and thoughtful review.